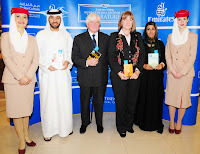 22nd June 2009, Dubai, UAE: Organisers of the Emirates Airline International Festival of Literature (EAIFL) today called upon students across the UAE to put pen to paper over the summer holidays for the 2010 Students’ Writing Competition. The theme of this year’s competition is ‘The Adventure’. The 2010 Students’ Writing Competition will have four age categories; ‘ages 11 and under’, ‘ages 12 to 14’, ‘ages 15 to 18’ and a new age category for undergraduates in full-time education over 18 years of age. The maximum word count for children in the category ‘ages 11 and under’ will be 500 words. The maximum word count for children in the category ‘ages 12 to 14’ will be 1000 words. Students in the category ‘ages 15 to 18’ and undergraduates in full-time education over 18 years of age, will have a maximum word count of 1500 words. Students are invited to submit their stories in either Arabic or English before the closing date which is 5th November 2009. All the winning entries will be published by Jerboa Books in a dual language book of short stories entitled ‘The Adventure’. Each winner will receive a copy of the book signed by one or more of the famous writers who will be appearing at EAIFL 2010 and a selection of books. The winners will also be invited to an official ceremony at EAIFL 2010 where their co-authored book will be launched. ‘‘Last year’s competition had an excellent response from budding writers from all over the UAE, and this year we are hoping to be overwhelmed!’’, said Jane Hodges, Publications Coordinator at Jerboa Books. The 2009 Children’s Writing Competition saw 22 winners selected from several thousand entries. The winners received their prizes from the bestselling author Anthony Horowitz. The winning short stories were published into an anthology entitled The Sea. In a short space of time nearly 800 copies of The Sea have already been sold and a second print run has been commissioned to meet demand for this unique book.